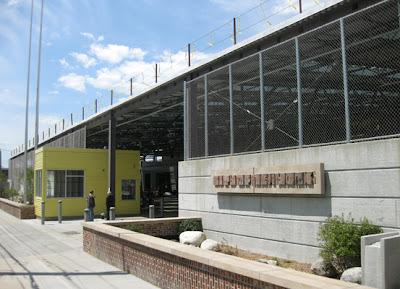 The Remsen Yard Reconstruction project is a maintenance facility for NYC’s Department of Environmental Protection (DEP), supporting the city’s water and sewer operations. The 2.5 acre property accommodates DEP vehicles, their equipment storage and material piles, and personnel support facilities, such as locker rooms, bathrooms and administrative offices. The projects is to exemplify New York City's commitment to design excellence and environmental sustainability. 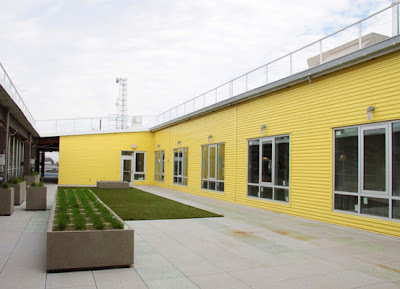 Located in Canarsie, Brooklyn, surrounded by small commercial establishments, industrial repair shops and warehouses, and one and two family homes, the new 46,000 square foot facility replaces an existing one-story DEP facility which had become outdated, was deteriorating, and had become too small to meet the DEP's needs. The new two-story building is integrated into a large sky lit roof covering for vehicle parking, fueling operations and materials. Within the building itself is equipment storage, machine shops, and vehicle garages on the first floor with administrative and support functions located on the second floor. Open offices and a lunchroom open up onto an exterior courtyard which provides natural light, while providing a protected view into the north yard. Daylight is provided throughout the rest of the occupied spaces with the building's shallow floor plate, ample exterior glazing, and skylights including 16 long skylights on both the north and south yards, reducing the need for turning on lights during much of the day. 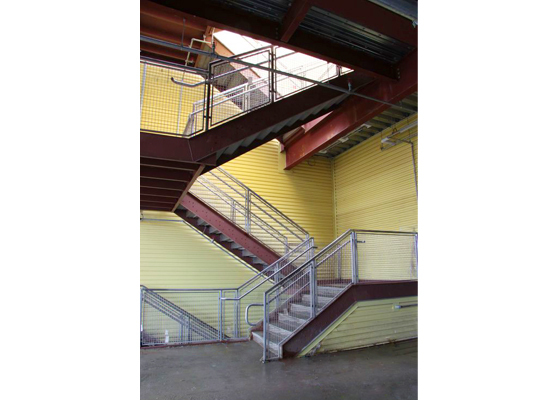 A majority (70%) of the facility is exterior or unheated space including exterior yards, and the main entry stair. The scheme was developed from early workshops with all users to solve DEP operational issues as well as integrate the projects high performance goals. 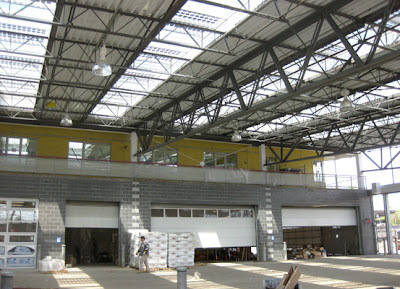 The large roof, that covers a north and south yard, is part of the integrated design concept of the “productive roof”: it shelters and shades the yard operations, provides natural light through its skylights, harvests rainwater for site-related uses, and produces up to 50kw of electricity from integrated photovoltaic panels. As part of the building's attempt to reduce overall potable water use an extensive rainwater harvesting system implemented that collects rainwater from the roof for yard activities including cleaning of trucks. The dominant water usage is in exterior yard operations, washing trucks and misting piles for dust control, using an average of 6,600 gallons per day, or 95% of the total water demand of the facility. The “productive roof” covers 72% of the site, sheltering the yard operations, vehicles, and piles while collecting over 1 million gallons of potable water annually for reuse. Most of this rainwater is collected through underground leaders to a 20,000-gallon tank where it is treated per NYC health guidelines, and reused at dedicated exterior hose spigots. The landscape features swales with adaptable, low maintenance, drought tolerant and native plants. The building was built using local products and materials with recycled content were given preference during the design of the project. The existing brick wall and unique mosaic were salvaged and incorporated into the design of the new facility. PCA worked with four of the five prime contractors to ensure compliance with the projects sustainability goals. We coordinated with all the contractors to ensure and document compliance with all targeted LEED construction credits. 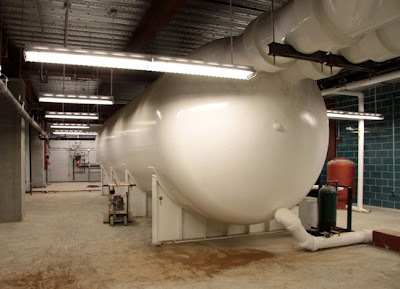 Work included collecting and sorting all materials submittals, ensuring compliance with Storm Water Pollution Prevention Plan, Indoor Air Quality Plan, and all other LEED specific requirements.